The Globales Costa Tropical is situated in the centre of Fuerteventura, one of the most popular islands in the Canaries. Offering guests a relaxing and enjoyable environment, you can soak up the sunshine in the outdoor swimming pool and unwind with a refreshing drink at the poolside bar. Moreover, you will enjoy the beautiful view of Fuerteventura resort right from your bedroom window. The year-round weather in Fuerteventura makes it a great destination to head to throughout the year, whether you want a summer holiday with the family or a winter getaway. 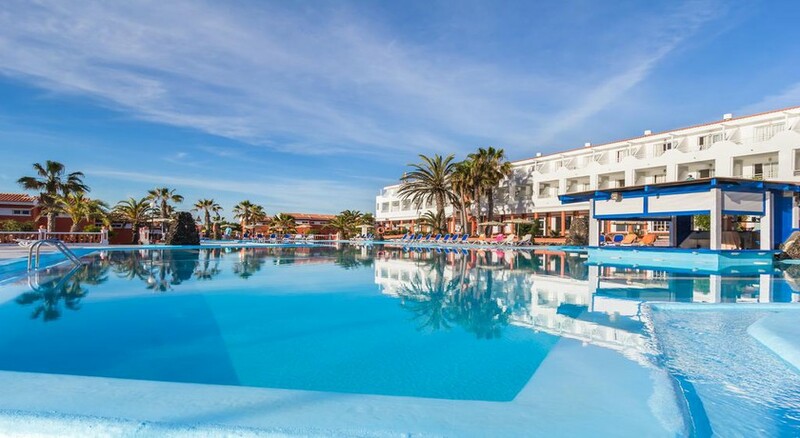 With a variety of room types, food and drink options as well as a fantastic location, you don’t need to look further than the Globales Costa Tropical Hotel for a relaxing break in the sun. The Globales Costa Tropical is situated in Costa de Antigua, Fuerteventura, Las Palmas, Spain. It’s only 2km away from the nearest town, Calete de Fuste, making it a quiet area and an ideal place to relax. The shopping centres, restaurants and bars are in Caleta de Fuste and Fuerteventura Airport is the nearest airport from the hotel, at roughly 6km away. The weather in Caleta de Fuste is pleasant throughout the year, making the nearest beach (approximately 3km away) a popular pastime. The bungalows and the apartments at the Globales Costa Tropical are well-equipped and gracefully decorated. All of them have a balcony and a terrace from which the guests can enjoy the sea view. The bungalows and apartments feature all the necessary amenities, including a safe box, flat TV, satellite TV, cooker hood, bath tub, kitchenette, hair dryer, sofa bed, phone, fridge, kettle, Wi-Fi, balcony, a bathtub and much more. There is an additional charge for some services such as massages and use of the sauna and Jacuzzi. You can prepare basic meals in the hotel rooms or enjoy dining without the pressure of cooking, thanks to the all-inclusive buffet serving breakfast, lunch and dinner. Bar Salon serves drinks that are also included in the all-inclusive plan. A restaurant, lounge/bar, coffee shop and poolside bar are also available. Guests who want to enjoy tasty Italian food can head to Pizzeria Mamma Mia, which specializes in Italian cuisine while the Restuarante Buffet Costa specializes in international cuisine. Whether you want to indulge in a dip in the swimming pool, take part in sports or unwind yourself with a massage – you can at Globales Costa Tropical. There are a number of sports, entertainment and relaxation facilities in the hotel for adults as well as children. Sit back and relax on the sun loungers positioned around the pool while the kids keep entertained in the on-site Kiddie park or mini club, both under the supervision of the hotel’s staff members. Further sports facilities include football, tennis, bicycle hire, gym, tennis-plus a relaxing Jacuzzi, sauna and massage service for extra charges. We would like to inform you that as from the 02/01/19 we will stop offering our a la carte service in the Pizzeria for closing reasons. We currently have improvement work in a part of our restaurant. The part where we work is closed and with changes in floor and ceiling in addition to touch-up paint to leave more updated a dining room that was already a bit out of fashion. Quite hotel in residental area , clean hotel. Staff do all they can to help. Love this hotel. Pool big very cold, swim up bar. We had a great holiday last year at this hotel . The pool was lovely ... Perfect for my little Grandson the little pool with slide . Equally the bigger pool was perfect for me ... Especially the swim up bar . Staff always very polite , helpful and cheerful . Food was very good with a good choice . Rooms were lovely . Beds very comfy . Entertainment was ok for us. Had another brilliant time here. Only problem was the pool being out of action for the first few days and the lack of evening entertainment that was remedied by the second half of the week. Going back again in october. Enjoyed our stay. Some people take the all inclusive alcohol too far.